Large sized red fruit. Good for fresh use, jam and jelly. Very hardy. 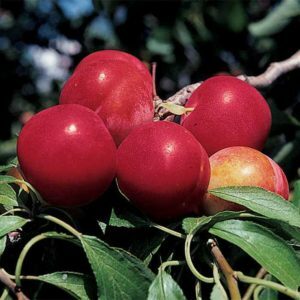 Pembina plum is ovate and pointed, its flesh is yellow, juicy and sweet. Its skin is red with a bluish bloom, acidic and thick. 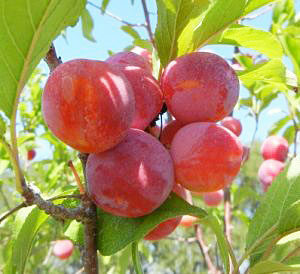 It is a mid to large size plum and it has a good flavor. It is half-freestone, which facilitates a bit the preparation in cooking. 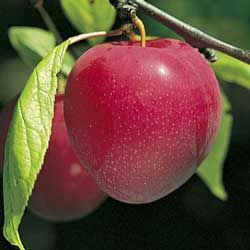 Pembina plum is a good choice for dessert, and it is fair for cooking and canning. 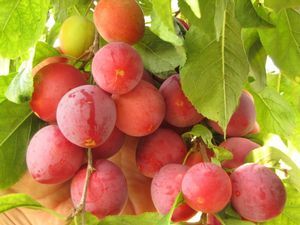 Pembina plum is ovate and pointed, its flesh is yellow, juicy and sweet. Its skin is red with a bluish bloom, acidic and thick. Immense sized red fruit. Good for fresh use, jam and jelly. Very hardy.